One of the most pleasant surprises to come out of TGS last year was the announcement that Square Enix’s Dragon Quest series, one of the towering monuments of the JRPG genre, and Nintendo exclusive for the better part of a decade now, would be returning to PlayStation with Dragon Quest Heroes, a brand new Dragon Quest themed Dynasty Warriors game (think the Dragon Quest equivalent of Hyrule Warriors). 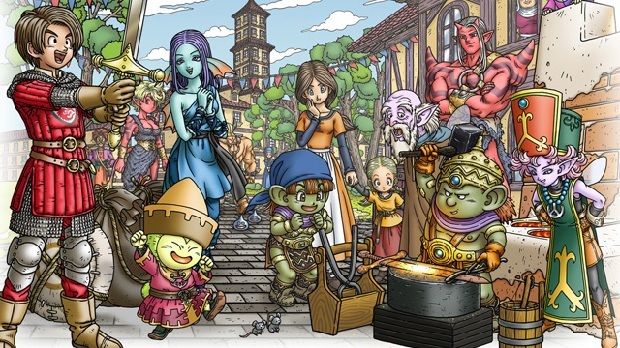 Dragon Quest Heroes was announced for both, PlayStation 3, and for PlayStation 4, which led to owners of both consoles immediately worrying that they would get the inferior version- for PS3 owners, it was the question of wondering whether the PS3 version would be a compromised downport, clearly far too taxing for the console’s aging hardware; for PS4 owners, it was a question of whether it would be a compromised upport, with nothing taking advantage of the newer PS4 exclusive features and resources. Well, now Square Enix has answered how the game will be different across both consoles, and… it appears that the answer is somewhere in the middle. The game will be largely the same across both systems, but the PS4 version will get the PS4’s much vaunted Sharing features, in addition to very limited compatibility with SharePlay, as well as more enemies on screen than the PS3 version. The PS3 version is also confirmed to be running at 30FPS, while the PS4 version will hit 60FPS. And that’s it- so if you have a PS3, you will not be missing out on anything by simply buying the game for that. That is, of course, assuming it ever actually makes its way over to the west at all.